With much of the investment world focused on crypto currencies and blockchain, it’s no surprise that the fundamental building blocks of the physical world have been ignored for so long. The focus in recent years has been on mining digital assets, but in the real world mining companies that specialize in essential metals like silver and zinc have been warning of massive deficits that, as SGT Report notes in a recent interview with Callinex Mines CEO Max Porterfield, could easily lead to supply shortages. 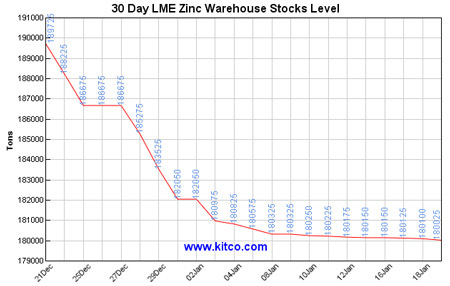 The zinc market is already very, very tight… we’re in a supply deficit… you look at zinc inventories and those inventories are less than 10 days of zinc supply… and it has declined over 85% since 2012… we’re at critical levels. The following chart shows just how much stockpiles are plummeting while demand continues to rise. On a global basis zinc is the fourth most consumed metal in the world… it’s used in pretty much everyday life in just about everything that everyone uses… we take it for granted. … You can’t build a building with a crypto currency, but you sure can with zinc, iron ore and copper and those types of commodities we use and rely on everyday of our lives. The crypto craze will likely continue going forward, but physical assets will always reign in the end. Highlighting this reality, SGT Report and Max Porterfield note that even precious metals brokers are now starting to accept Bitcoin because of rising demand from blockchain investors who want to convert their digital bits and bytes into hard assets. No one can hack your gold.